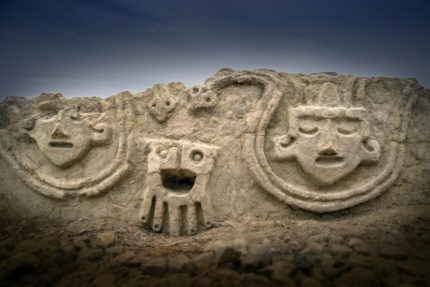 Archaeologists have discovered a 3,800-year-old wall with a large relief at the ancient site of Vichama in Peru’s Caral Archaeological Zone. The relief is one meter (3.2 feet) high and 2.8 meters (9.2 feet) long and features four human heads, eyes closed, entwined by two serpents. Where the heads of the two snakes meet in the center of the wall is a fifth head, not human but anthropomorphic with a wide-eyed face and five appendages. Experts believe it may be a representation of a seed putting down roots. The wall is made of adobe bricks and was found in the antechamber of a public building believed to be a ceremonial hall. The building was remodeled and built up over the years until it reached an area of 9400 square feet. The structure faced Vichama’s agricultural fields in the Huaura Valley. 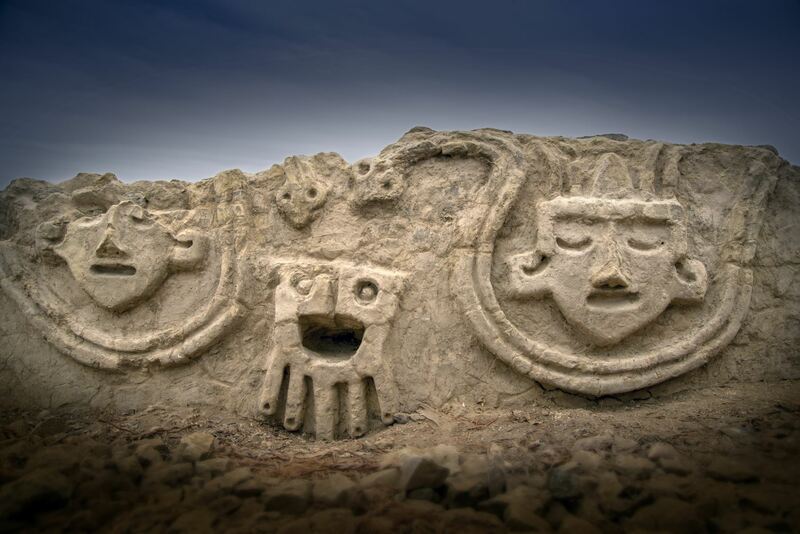 Vichama was an urban center of the Norte Chico civilization, the oldest in the Americas, which thrived in the coastal area of north-central Peru from around 3500 B.C. to 1800 B.C. Caral was the largest and oldest of Norte Chico’s settlements and may have been the oldest city in the Americas. Vichama was built in the last period of development of the Norte Chico culture. Its remains were first unearthed in 2007 when the modern-day city of Végueta threatened to expand into the archaeological zone. Cultural heritage officials and the municipality made a deal to keep the site safe and thoroughly explore it. Excavations have been ongoing since then, and the unique art and architecture of Vichama attest to a major climate crisis that struck the area around 3,800 years ago. A succession of droughts lasting between 60 and 130 years caused widespread famine. Under too much pressure from famine and water scarcity, Caral was abandoned during the crisis. Vichama pulled through because it was just meters away from the ocean and was a major agricultural center as well, with fields extending the length and breadth of the right bank of the Huaura River. The combination of agriculture and fishing got its population through the hard times. Archaeologist Ruth Shady, who oversees the site and announced the discovery, hypothesized that the serpents represent a water deity that irrigates the earth and makes seeds grow. Shady said the relief was likely done towards the end of a drought and famine that the Caral civilization experienced. Other reliefs discovered nearby showed emaciated humans. Archaeologists believe that the relief discovery reinforces the notion that these early humans were attempting to depict the difficulties they faced due to climate change and water scarcity, which had a large impact on their agricultural production. This relief and other finds will be open to visitors on Friday, August 31st and Saturday, September 1st, the 11th anniversary of the start of excavations at the site. On a side note, the gleeful face of the anthropormorphic seed reminds me that one of these years I have to make a set of emoticons for the blog that are pixel versions of highly expressive reliefs, masks, false heads, mummy portraits, mosaics, figurines, anything archaeological (and yes, of course that includes poop). I’ve come across enough pieces to ensure my archaeological emoticon team would be as diverse as it is educational.